Nanni's jerk chicken is located on Norman Manley Road accross from the Sea Wind Resort next to Ozzie's jerk center. Best Of The West lives up to it’s name. The Jerk Chicken here is prepared “Boston Beach” style. Boston Beach located on the eastern tip of Jamaica near Port Antonio and is considered the birthplace of Jerk. 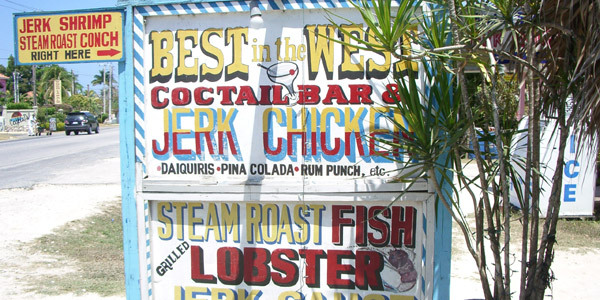 The Jerk Stands at Boston Beach are the best in the east, hence, Best Of The West. Come & Enjoy The World Famous Jerk Chicken. Bourbon Beach is located in Negril, Jamaica on Norman Manley Boulevard and on Negril's famous 7 Mile Beach. If you like it hot and spicy, you will enjoy Bourbon Beach jerk chicken. This is one of those hidden gem places that only those familiar with the real Negril know about. A lot of locals eat here and take home carry-outs and so do tourists from nearby resorts, including myself for many years. Roy Felix has been selling "Serious Chicken" in Negril since 1982. Roy started off by selling chicken at a roadside stall. Roy's trademark "Serious Chicken" dish of grilled marinated chicken served with a special sauce became so popular that, in the summer of 1996, he moved from his stall on Somerset Road and set up his own "Serious Chicken" restaurant. Just show up on the doorstep of this place along the West End beach strip, and see what's cooking. Curried goat is a specialty, as is fresh fried fish. The red snapper is caught in local waters. But the big draw is the restaurant's namesake, the chef's special Jamaican chicken. Leroy has one of those half an oil barrel grills on the side of the road directly across the street from CatchaFalling Star on Lighthouse Road in Negril, almost to Ricks Cafe. Smokey Joe is located along the Norman Manley road accross from the Grand Pineapple Resort. Opposite Coco La Palm and Charela Inn. The Jerk Chicken is done to perfection here. Spicy, succulent, sensational, savory, and super-yummy! Best Of The West is more than just a roadside jerk stand, they have a menu that will tempt you from mid-morning till late at night.